Read-out Instrumentation Signpost: Safe enclosure! 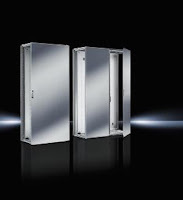 The new Rittal VX25 large enclosure system offers electrical engineering companies significant added value thanks to its technical features, ease of assembly and high levels of safety. Now, all the benefits of the VX25 are also available in stainless steel and NEMA 4X versions. This way, Rittal is making its innovation fit for the highest demands in terms of corrosion protection and to meet demanding conditions that involve dust, as well as splashes and jets of water. This is now available in a 100% stainless steel version to meet the highest demands for corrosion resistance. In addition to the frame structure, doors, panels and the gland plate, all the external parts such as 180° hinges and comfort handle variants are also made of stainless steel. While the sheet steel and stainless-steel enclosure types have IP 55 and NEMA 12 protection categories as default, the optional NEMA 4X version with its corresponding IP 66 category protection offers increased protection. This means that the electrical and electronic equipment in the VX25 is reliably protected against dust, water splashes and jets, even under demanding conditions. In order to achieve the high NEMA 4X protection category, the enclosure had to undergo a water jet test, among other things. This procedure (“hose-down” test), in which all gaps with seals were examined for leaks using a jet of water with a flow rate of over 240 litres per minute for a test period of 40 min/30 s (6 mm/s per seal length), confirmed that no water could penetrate the enclosure under comparable conditions. Furthermore, the test procedure includes a check of the dust protection, corrosion resistance, and protection against damage caused by external ice formation. The almost identical design of the two VX25 enclosure types means that the engineering of the interior can be transferred a 100 percent from the stainless-steel enclosures to the NEMA 4X enclosures. This way, electrical engineering companies can save both time and money in engineering. When VX25 stainless steel enclosures also need to be equipped with energy-efficient cooling technology for applications in demanding environments, the new Blue e+ cooling units in stainless steel are now also available to electrical engineering companies.